Since a big part of our mission at the Philadelphia Water Department includes protecting and advocating for our rivers and streams—our drinking water sources—Earth Day is a natural fit for us. Earth Day 2017 will be celebrated this Saturday, April 22, and we’ll be there for one of Philly’s biggest green events: the official opening of Bartram’s Mile, a brand-new, 1.1-mile leg of the Schuylkill River Trail that also features streetscape improvements to connect nearby residential streets. Bartram’s Mile—the first stretch of the Schuylkill River Trail to reach the river’s west bank within the city—is an exciting public-private partnership that will add a beautiful new mile-long greenway to the Schuylkill River. Partners on the project, which broke ground on November 23, include Philadelphia Water, Parks and Recreation, the Schuylkill River Development Corporation, Philadelphia Industrial Development Corporation, the William Penn Foundation and Bartram’s Garden. You can read a good Philadelphia Magazine article on the new trail segment by clicking here but, in essence, Bartram’s Mile will follow the Schuylkill River from Grey’s Ferry Avenue to 56th Street and include a new pedestrian bridge connecting South and West Philly. This exciting improvement is designed to bring many more residents and visitors to our waterfront, which is becoming more and more popular as our rivers become cleaner and more attractive. It will also provide easy access—a new gateway for pedestrians, cyclists and more—to some local gems like Bartram’s Garden, the Simeone Foundation Automotive Museum, and John Heinz Wildlife Refuge. Construction of the proposed “Schuylkill River Swing Bridge”—what the east-west connector is being called—could start as early as this summer and be complete by the end of 2017, according to Plan Philly. And (as if creating a new green amenity for the city and providing a brand new way to access the waterfront isn’t cool enough!) this project will also fight stormwater pollution with an innovative green infrastructure “greenway” on three nearby streets. The Schuylkill River Trail, America's Best Urban Trail, in Center City. Photo courtesy of Montgomery County Planning Commission. The Schuylkill River is closing out the summer in grand style and getting national attention as a premier destination for urban nature lovers. On Wednesday, Philadelphia Water joined officials and groups from across the region on the river's banks to celebrate the Schuylkill River Trail (SRT) being named America's "Best Urban Trail" by USA Today. The now 65-mile pathway connecting Philadelphia and the upper reaches of the river won the top honor in an online voting campaign held earlier in the summer, and the designation has helped bring a spotlight to the SRT's scenic and functional qualities. Eventually, the trail will grow to about 130 miles and connect the city and Pottstown in Montgomery County. The recent restoration of the Schuylkill Canal Towpath in Upper Providence Township is another win for the trail that added some fresh ground for cyclists and hikers to explore. John Quigley, secretary of the Pa. Department of Environmental Protection, was at the Wednesday celebration and said the Best Urban Trail status points to a growing appreciation for the river—something he hopes will translate to more people advocating for the environmental health of the Schuylkill. “What we’re celebrating is not just about recreation. This project is about building a constituency for the river,” Quigley told Mercury News, which covered the event. Check out the full Mercury story here. For Philadelphia Water and partners like the Schuylkill Action Network and the Schuylkill River National and State Heritage Area, the national recognition is proof that decades of working to improve water quality is paying off. Mike Iaconelli & Takahiro Omori above the Columbia Ave. Railroad Bridge via Mid-Atlantic Youth Anglers. Omori, who was in the area for the 2015 Bassmaster Elite at Chesapeake Bay, came up to Philly and reportedly had an action-packed day of fishing on the river thanks to the Mid-Atlantic Youth Anglers association, which helped him explore some of their favorite spots. Speaking of fishing, don't forget to sign up for the Philly Fun Fishing Fest on Sept. 12—registration closes Sept. 10! RSVP by clicking here. Schuylkill River Spree Under Way, Includes All-New SRT Ale! The Schuylkill River Trail, photo courtesy of Montgomery County Planning Commission. One of the greatest uses humankind has devised for water is brewing that wonderful elixir known as beer (and ale, pilsner, lager, stout, porter or whatever whets your whistle on a Friday!). And one of PWD’s most important missions is safeguarding our beer water supply by acting in collaboration with other communities and groups as stewards of our wonderful Schuylkill and Delaware Rivers. Reminiscent of Lewis & Clark, the SRT Spree includes a two-man-team representing Sly Fox Brewing Company. This is not an organized group excursion although fans of Sly Fox beer and the Schuylkill River Trail are welcome to travel along any segment of the journey or the entire trip. The team will travel by kayaks, road bicycles, trail bikes, horseback, recumbent trikes and on foot to advance the giant can to the final destination. Each day the Spree will stop along the trail for an organized trail cleanup and recognition of a local beer purveyor that will introduce SRT Ale to the public. You can volunteer to participate in the SRT Spree and help out with one of several trail cleanups planned for today through Wednesday. They are still very much in need of volunteers for tomorrow morning, in Kernsville from 8-10 a.m. if you can make the trek out to a community upstream! Use this link to sign up for one of the clean-ups. And get this… Trail Cleanup volunteers aged 21 and older will be given one free voucher to taste the new beer! SRT Ale tappings will be held each evening at licensed establishments located near the cleanup sites. Cheers! An estimated one million people use the Schuylkill River Trail throughout the year. 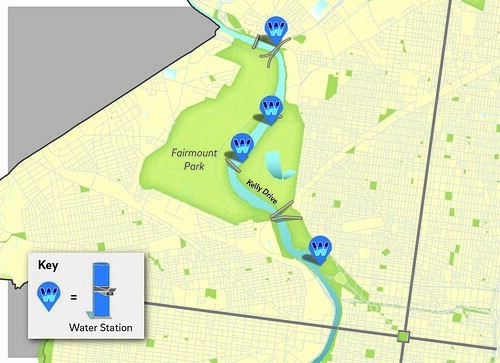 The Fairmount Water Works is looking for artists to create prototype art installations for the Schuylkill Trail as part of the Circuit, a 250-mile long series of trails used by joggers, cyclists, commuters and more. The intent of the art installations is to grab the attention of people using the trail and connect them to the river. The art will serve as a creative, fun way to educate trail users about urban watersheds, water quality, history and more. Ideally the artwork will also feature new technologies and online platforms to promote sharing and connect to a large audience. The selected artists will be a part of the project team led by The Fairmount Water Works, The William Penn Foundation, and Habithèque Inc., and includes Philadelphia Parks and Recreation, City Parks Association, Schuylkill River Development Corp, Philadelphia Museum of Art, Bartram’s Gardens, The Center for Emerging Visual Artists, The Schuylkill Center for Environmental Education, and City of Philadelphia representatives. Together, the project leaders and team will collaborate with the artists to conceptualize and refine their projects into a prototype that will be installed and tested on the circuit. Feedback from trail users and lessons learned during this planning process will then be used to gain support for carrying out the actual works along the Circuit. Applications for this exciting opportunity are due by September 8, 2014. Click here for the full Request For Qualification document and more information.